Hot coffee in the hot summer time? Who does that? Not me. Just can't. There's so little worse than it being hot and sticky, only to get hotter and stickier by ingesting copius amounts of anything warm. I'd personally be happy to not eat or drink anything that wasn't hovering around frozen from June to a week or so into September. We don't have AC, so don't judge. Still gotta drink coffee though...so cold brew does it. Gets pricy buying it one cup at a time. Source: my barren bank account. 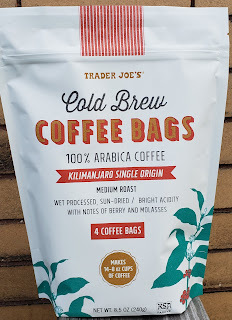 Sandy and I bought a mason jar filter contraption for make-at-home cold brew, which works well, but we'll sometimes resort to concentration-type concoction, or in this case, Trader Joe's Cold Brew Coffee Bags. It's a simple concept, really. Put seven cups of water into a pitcher, stick in a couple of these coffee beanie bags, let it steep and chill overnight. It's premeasured and convenient and all that - it should be idiot proof. We know enough from experience now that if ratio of bean to liquid is off, it'll ruin the whole cup. And by coffee beanie bag, I mean, think of a tea bag, or some coffee grounds sealed inside a filter. Works, right? Right? I'll say this. It's a good concept, but not the best results. Neither Sandy nor I really enjoyed the coffee. It just tasted flat, dull and like dirt, which I wasn't fully expecting from the write up on the bag. It sounds like pretty premium beans. And I'd expect more flavor and depth and character, I guess, based on my at-home or at-coffee shop expereinces. Then it hit me. The fatal flaw. And it's rather obvious. The coffee is pre-ground and has been ground for days if not weeks or longer by the time we're using it. You can't beat fresh ground coffee beans, which is what I'm used to. Actually, you can, if you also roast your own, as my dad does, but that's another story. It's not to say that these are stale, gross coffee - it's not - but there's a lot that's lost to time here. All that being said, if you're the type who tends to doctor up your cuppa joe all orange mocha frappucino type, or add loads of cream and sugar and whatnot, this might be an okay base. It's not like you really taste coffee then anyways. But if you drink it black, as I do, you'd be better off with one of those aforementioned filter guys for an at-home batch. It's just as easy and convenient. Eh well. These TJ cold brew pods cost like $5 for the four pack, which is enough for two large batches. So it's a decent value, but it's unlikely to be a repeat buy. Double twos here. Aw I was looking forward to these. I'm about to try my overnight brew. I only used 1 bag and half the water. Will that change the outcome of the coffee? I agree these were dismal if you actually like drinking real coffee. I’ve found that these need 24 hours to brew to be somewhat decent and not the 12 hours as the packaging suggests. How is everyone brewing this? 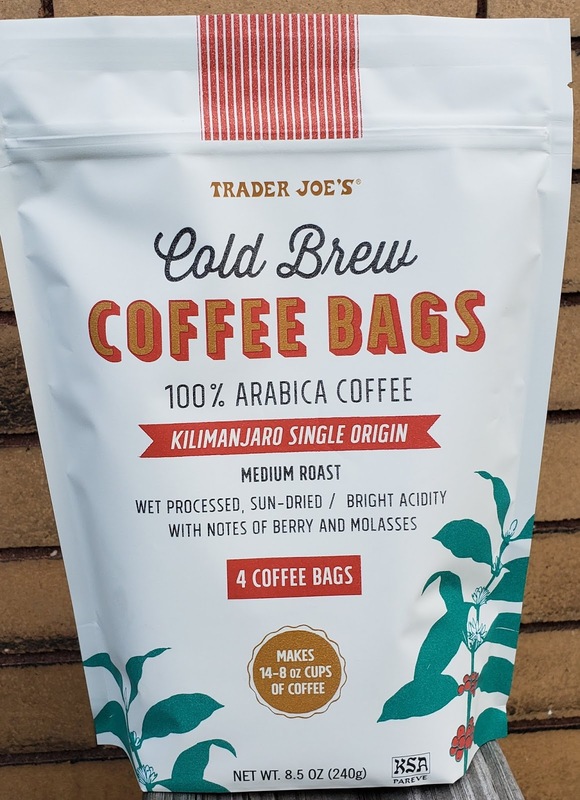 I was highly highly skeptical of this product because of the exact reasons you mentioned- preground coffee that has been sitting around for God knows how long. But I've been pleasantly surprised- this has worked really well for me in a French press to keep the bag submerged (brewed for at least 12 hours). It has the right amount of acidity and a slight fruitiness, and I drink it black. While it's not my favorite cold brew ever, I must say that the taste is similar to any standard coffee shop in my area. I really enjoyed these. I used a cup of hot water first and let the bags just sit in that for a few minutes, then I added the rest of the water (at a normal temperature) and popped the pitcher into the fridge for 24 hours. I used this and a splash of Blue Diamond unsweetened vanilla almond milk and it was delicious. Just get a cold brew pitcher, there like $15-20, and work great. I usually let mine go 24 hrs, I’m half Italian so I like my coffee strong and feel 24 hrs is perfect it’s stronger without being bitter, if you let it go too long it gets bitter. I have acid reflux and cold brewing has less acid in the coffee, so I’ve been doing it over a few yrs and love it.